The Todd Community Preservation Organization (TCPO) is involved in many aspects of the community with a variety of activities. A major function of the TCPO is to maintain outdoor spaces for public use and private special occasions. The TCPO owns and maintains Cook Park and Todd Island Park. Ongoing maintenance includes landscaping, mowing, providing facilities and electricity, refurbishing walking bridges and other structures. Need a beautiful outdoor space near flowing water to rent for your special event? Tents, facilities, and decorations are available to rent as well. Contact us for more information. The park is located in downtown Todd and serves as the main outdoor gathering space for the town. The covered stage, dance platform and smaller covered structure are used for concerts, picnics, revivals, weddings and other events. There are public facilities during the months of May through October. Please Contact Us if you are interesting in reserving the park for an event. There is a rental fee for private events. 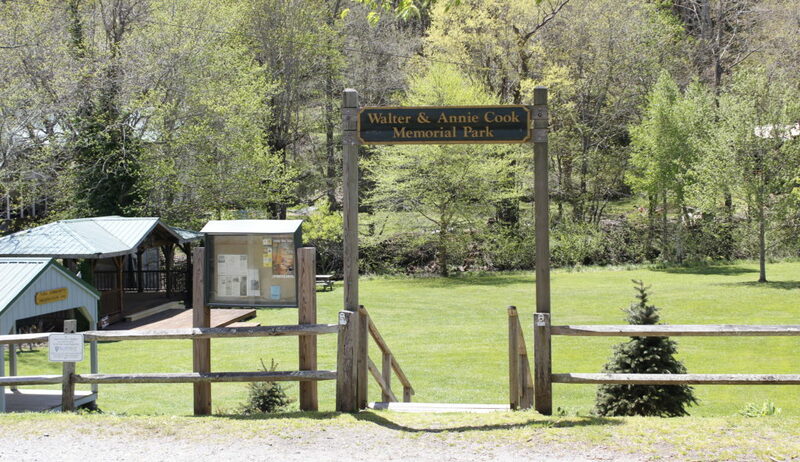 The 10-acre park is located in the South Fork of the New River, about 3 miles east of downtown. There is a walking bridge to the island which has a one-mile walking track around the perimeter. The river around the island park, part of the Mountain Heritage Trout Waters Program, is a main fishing destination for the area and is stocked with brook, brown and rainbow trout on a regular basis. The summer concert series is in its 13th year and is a favorite summer event for residents and visitors alike. The family-friendly concerts are held in Cook Park and are free to the public. The TCPO organizes the series with the generous support of sponsors and volunteers. Please see the concert schedule for more information. The TCPO works continuously to secure recognition and designations for Todd based on its rich natural resources and history. The majority of buildings in downtown Todd are listed on the National Registry of Historic Places. Todd’s summer music series is part of the Blue Ridge Music Trails of North Carolina. Parts of the New River in Todd are included in the NC Public Mountain Trout Waters program and the river around Todd Island Park was recently designated as NC Mountain Heritage Trout Waters. Designations like these help preserve Todd’s heritage and improve its infrastructure for the enjoyment of all.